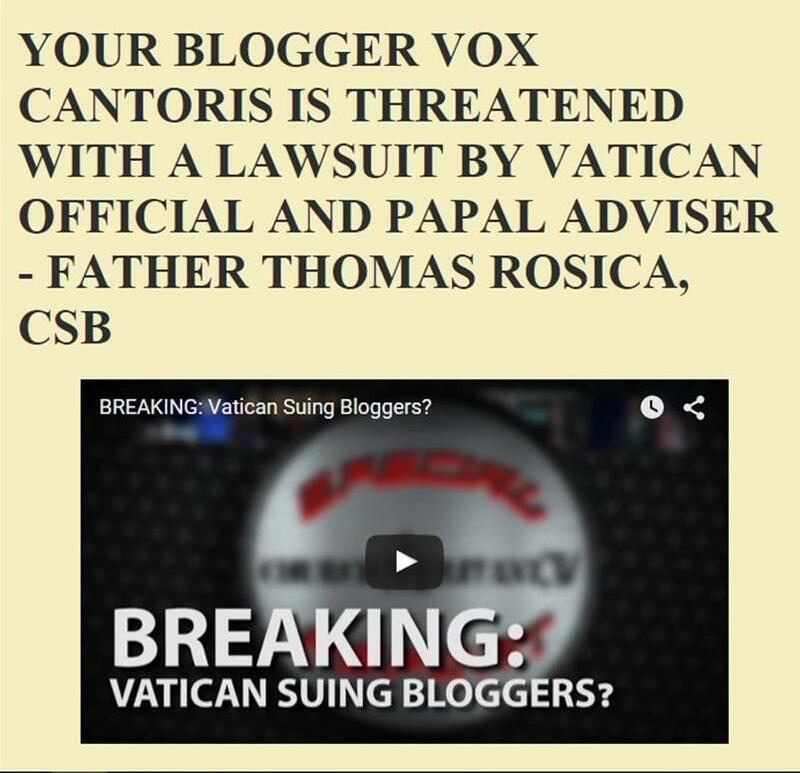 Vox Cantoris: Has the correction of Bergoglio been done? Does Bergoglio intend to change the Mass - Roman Rumours! Has the correction of Bergoglio been done? Does Bergoglio intend to change the Mass - Roman Rumours! 1. Consistent reports are coming that the four Cardinals have met with and issued their correction to the Bishop of Rome. If he does not respond, they will go public. 2. It is also rumored that Cardinal Muller has resigned from the Congregation of the Doctrine of the Faith. On the Mass, it looks as if my recent theory is now also rumoured in Rome. More soon. About time !!!! Maybe you meant on Point 2 that Card. Mueller had resigned from the CDF and not Card. Burke ! THANKS SO MUCH VOX for keeping us all abreast of the news SO PROMPTLY ! May Almighty God bless you ! And protect you all ! So, if Muller did resign, is it the assumption that he was forced to resign or that he resigned on his own? If what you say is true, what wonderful news: saints have arisen this day. God be praised! I will continue praying for them (and all being persecuted by Team B); & also the apostates that they might be converted and live. Those rumours are correct about 80 percent of the time. So we will just wait and see. I hope that these 'rumors' turn out to be true, because the persistent silence of the four dubia Cardinals, as well as the foolish defense of Amoris Laetitia by Cardinal Mueller, are very hard to take. One watches Bergoglio trash all that is supernatural and precious in our Faith while those who have the authority to speak out do not. The 'holy appeasement' we are witnessing is only cowardice. It is sickening and absolutely not of God. Such weakness on the part of the Cardinals and Bishops only emboldens the devil in Rome to reach even further into the treasury of grace given us by the Son of God and destroy it. Why would anyone not believe that Bergoglio intends to tamper with the Mass when we have seen what he has done with the Sacrament of Matrimony? He is on a trajectory of destruction of all that is of God. Every moment that the proper ecclesiastical authorities do not speak is a moment lost for God. I pray God the rumors sited here are absolutely true. What has to be understood and accepted is that we are looking at schism. Where the fullness of the Faith is upheld will be where the Church is. There will be no other way this can go. the new 'one world church will be in Rome and Bergoglio will reside there. He indeed is 'under the influence of the devil'. He must be challenged publicly and NOW. Yes indeed the MANY PERSISTENT rumors around Rome are just this. This is according to many, but also Deacon Donnelly who has much of this on his Twitter feed. According to him and many, Bergoglio HAS BEEN CORRECTED in PRIVATE, as the Cardinals said he would be. And....the Cardinals have promised that if he does not answer the CORRECTION THEY WILL AGAIN GO PUBLIC WITH A FORMAL CORRECTION. The war is now reaching a climax, I do believe. Be prepared to go to the Catacombs and to be persecuted. As Vox stated: WE ARE ABOUT TO BE NAILED TO THE CROSS. As I am old, I have learned a few things, and I have learned this: that to try and prepare for something as monumental as this and to actually LIVE IT are two different things. We need DIVINE INTERVENTION from all of HEAVEN, in order to weather what's coming. Our Lady of Fatima, PRAY FOR US! ALL HEAVENLY SAINTS AND ANGELS OF GOD......PRAY FOR US!!!!! Bergoglio the false Prophet will do anything the Communist Marxists will oder him to do. He is Pope on their behalf. This is the Catholic Spring Revolution that was taked about in John Podesta's Wikileaked emails which were emailed before the Conclave. Then the stoppage of the Swift Banks transitions of money to the Vatican Bank four days before Pope Benedict did the unthinkable and resigned. Then the day after not even twenty-four hours after the resignation of the Pope, the first ever. The Swift Banks started transactions with the Vatican. Then the Communist Marxist Shadow Government had CIA agents and NSA agents involvement with the Conclave. Then the secret Lobbying meetings in Switzerland with Communist Marxist Cardinals Kasper and Marx. After the Bergoglio deception had won the Chair of Peter, Cardinal Kasper gets to direct his pet project, the Synod on the Family which the results were already decided before the Conclave in Cardinal Kasper's Lobby meeting in Switzerland. Hey like it or not the Conclave has been compromised by the Communist Marxists Homosexuals in the Vatican. It is only a matter of time when the reign of terror will climax with a Lutheran service will be installed without the presence of Christ in the Sacrifice on the Altar without Priests so that Lesbian or Transgender Women Deacons could lead the service. Satan has entered the Catholic Church. His False Prophet is working hard to destroy the Traditions of the Catholic Church in order to bring in Satan's new gospel to introduce a false-Christ, the anti-Christ far worse and more violent than Martin Luther introduced to the world. This being done on the 500 year Anniversary of the Heretic Martin Luther and on the 300 year Anniversary of FreeMasonary who are out to destroy Christ in the Eucharist and the absolute Truths of the one Holy Catholic Church. The coordinated effort by the globalist propaganda to vilify Cardinal Burke (Washington Post: cleanse the far-right rot!) comes at the time of the private correction by the Four. Bergoglia has already responded, and will respond publicly - but it will look as though he is listening to the people, and purging the rot. it will appear to have nothing to do with the correction. This is of course necessary for the changing of the Holy Mass. For what decent man woman or the other dozens of genders can possibly see anything wrong or questionable in building bridges and bringing about unity? The rot must be removed, and s it will be. The script has been written a long time ago. Where we imagine road blocs to the devil's... progress, he is... SERENE. I would say the Formal Correction was made before the KOM fiasco & Cardinal Müller's interview, so there is now this extreme rush to change everything that the CC has stood for since the First Apostles, i.e. One, Holy, Catholic & Apostolic. We have not been One, Holy or Catholic since VII, now the Apostolic must go. The four Cardinals must act with haste & determination in calling an Informal Council to denounce PF's heresy & tell us not to follow him. Then I would presume they will have to form a conclave (those still faithful to Christ) in order to elect a proper Pope that will fully restore the CC & Consecrate Russia immediately to the Immaculate Heart of Mary & reveal in full the Third Secret of Fatima. Both these actions, so long overdue, will work wonders in our fight against Satan. The CC needs strong & determined leadership which has been lacking these past sixty years, but those who would provide such will have to break forth from this demonic system which has emanated from the top & spread throughout most episcopates globally. As Fr. Fulton Sheen said "It is up to you, the laity, to remind our priests to be priests and our bishops to be bishops." And also the 100 year Anniversary of Fatima. We are witnessing, my dear brothers and sisters in Christ, what history has pointed to for millennia. This is the age-old battle being fought out before our eyes. May Our Lord Jesus Christ guide and sustain our champions, the faithful Cardinals, and bless and protect them. May He inspire the faithful to rise up and defend His Church. May He protect the sheep. For those who are not able to get to a TLM or Byzantine Mass, this will be an enormous trial. The One Hundred Years is almost up! Lord have mercy on us all! Pope Leo 13 pray for us! The rot in the Holy Catholic Church are the Vipers behind the Walls of the Vatican. It's the Swamp of decadence and putrid filth. The Swamp need to Drained. 1) you adulterated the Word of God in identifying Bergoglio as the "second beast" of Revelation 13. And the "smoking gun" of your adulteration is your lack of answer to the following question: if he's the second beast, who whould be the first one?